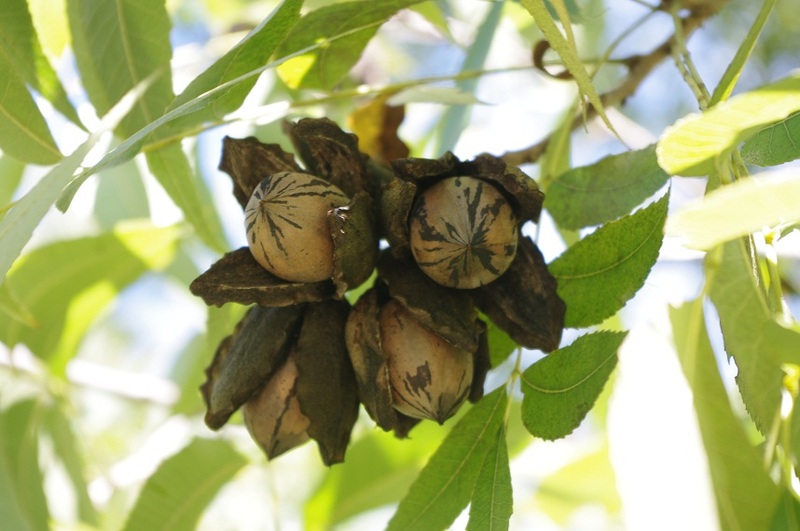 Tweed River Pecans is a family farm of 500 productive pecan trees, first planted in 1999. The pecan trees are grown in the fertile soils of the Tweed River Valley using biological farming methods. The growers, David and Kaye McNaught, carefully nurture their trees, harvest and pack the pecan nuts to ensure optimum flavour, freshness and nutrition. Here is a snapshot of the yearly growing cycle which produces these delicious pecans for you. Being deciduous, the pecan trees lose their leaves, resulting in a stunning vista of delicate silvery branches. Organic compost is spread on the orchard floor, clover flourishes and fixes nitrogen in the soil and cattle are grazed to add to the biological life. The farmers aim to build up the reserves in the soil ready for the trees to spring into life. In October the trees come alive again as buds swell and new foliage shoots out. Male and female flowers appear, with the wind spreading pollen through the trees to enable fertilisation. The growers are busy irrigating and mowing to keep the orchard floor clean. By December the new tiny nuts are clearly visible and will continue to grow in size over the summer months if the trees are given adequate moisture. Nutrients are applied to the orchard soil, including worm juice, seaweed extract and sea minerals to support tree health and life. Over summer, the farmers continue irrigating and prepare machinery for the harvest. In April and May harvesting is in full swing. Help from friends and family is very welcome! The trees are vibrated by a tractor-mounted shaker and ripe nuts fall onto shadecloth mats. The pecans are cleaned, sorted and dried using a dehydrator. Finally they are packaged and sent to markets and shops for you to buy and enjoy! Pecan nuts are a healthy source of energy, protein, minerals and the good oils.